Global tablet PC market expected to reach approximately USD 4,500 million in 2024, growing at CAGR of slightly above 3.7% between 2017 and 2024. Across the globe, manufacturing of connected devices is undergoing a tectonic shift. Manufacturing companies are investing in emerging markets due to tax incentives, less manufacturing cost and thriving local markets. Tablet PC is often recognized as a portable wireless computer to be operated using fingers or stylus on a touch screen interface. Tablet PC provides all the features of a laptop computer. Tablet PC also comes with add-on feature of handwriting recognition system (HRS), wherein handwritten data is digitized on a tablet pc. The information input is mostly done through LED touch screen interface and not with the mouse or keyboard. Other than using stylus and HRS information can be edited into the tablet using an in-built QWERTY keyboard. Customized tablet PC demand in last five years has increased considerably. An average price of customized tablet PC is USD 1000 more than conventional tablet PC available in the market. Healthcare and manufacturing enterprises, specifically in research domain are much sought after customers for customized tablet PC across the globe. Global tablet PC market is segmented in terms of size, type and end users. By size, tablet pc is classified into 7 inches, 8 inches, 9 inches, 10 inches and 11 inches. By type, the segment is further bifurcated as mini-tablet, slate, hybrid, gaming console, booklet and others (customized business or engineering tablet). The hybrid tablet is anticipated to grow with highest numbers due to its multifunctional capabilities. By end user, the market is classified further as schools & colleges, universities, commercial, residential, healthcare, pharmaceutical, retail, marketing, and others. Commercial tablets hold the largest market share, driven by rising demand for connected devices in India and China. Global tablet pc market is driven by declining mobile data costs, increasing adoption of enterprise-class tablets, and growing number of mobile & internet users. 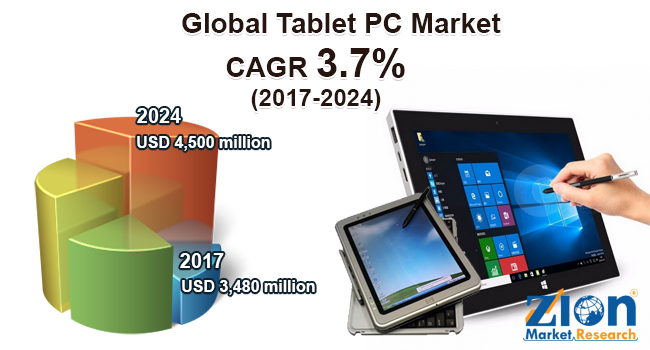 Similarly, fluctuating raw material costs, lack of connective ports, the fragility of the device and partial data processing capability are factors dragging tablet pc market growth for the forecasted period 2017-2024. Asia Pacific is the fastest growing market for tablet PC for the forecast period. The market in the region is driven by falling data costs, rising number of mobile & internet users, and the introduction of the pan 4G network across rural cities. A total number of internet users in the Asia Pacific in the Asia Pacific is anticipated to reach 2.6billion in 2021 from 1.7 billion in 2016 according to ‘CISCO VNI’ study. The study also highlights the fact that Tablet PC will account for over 2% of total networked devices in the Asia Pacific by 2021. Emerging economies like China and India are key driving markets within Asia Pacific region. China Internet Network Information Centre survey showed that the number of internet users in China is projected to reach 800 million by 2020 in tandem with rising population of the country. Similarly, Internet and Mobile Association of India estimates the number of internet users in India to reach 500 million by Q4 2018. Furthermore, IMAI anticipates the number of internet users in India to reach 800 million by 2020. Growing numbers of internet users in India and China will augment demand for tablet pc in the Asia Pacific. Players within global tablet PC market include Apple Inc., Lenovo Group Ltd., Samsung Technologies Ltd., Huawei Technologies Co Ltd., AsusTek Computer Inc., LG Electronics Inc., Acer Inc., The Hewlett-Packard Company., Microsoft Corporation., Pandigital., Google Inc., Nvidia., and HTC Corporation.